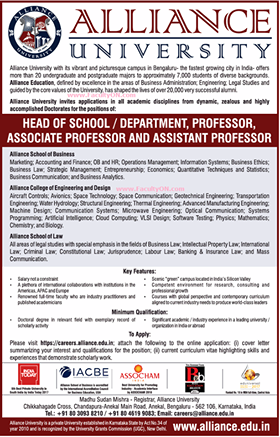 Alliance University, Bangalore has advertised in THE TIMES OF INDIA newspaper for the recruitment of Professor/Associate Professor/Assistant Professor jobs vacancies. Interested and eligible job aspirants are requested to apply by earliest. Check out further more details below. About College: Alliance University is a private University established in Karnataka State by Act No. 34 of year 2010 and is recognized by the University Grants Commission (UGC), New Delhi.Alliance University is located on an extensive state-of-the-art campus on the Chandapura-Anekal main road, Bangalore. Alliance School of Business: Marketing; Accounting and Finance; OB and HR; Operations Management; Information Systems; Business Ethics; Business Law; Strategic Management; Entrepreneurship; Economics; Quantitative Techniques and Statistics; Business Communication; Business Analytics. Alliance College of Engineering and Design: Aircraft Controls; Avionics; Space Technology; Space Communication; Geotechnical Engineering; Transportation Engineering; Water Resource; Structural Engineering; Thermal Engineering; Advanced Manufacturing Engineering; Machine Design; Communication Systems; Microwave Engineering; Optical Communication; All areas of Electrical Engineering; All areas of Computer Science Engineering and Information Technology, Physics, Mathematics, Chemistry and Biology. Alliance School of Law: All areas of legal studies with special emphasis in the fields of Business Law; Intellectual Property; International Law; Criminal Law; Constitutional Law; Jurisprudence; Labour Law; Banking & Insurance Law; Mass Communication. How to Apply: Interested Candidates may apply by online through following link by earliest.